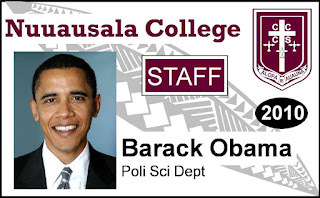 The ID at left is the staff ID I came up with for my school. I’m still unclear on how these IDs will ever officially be used for anything, so when I came up with the design, I was unclear on what information should be included. In the end, I opted for name and title. This is a staff ID, not a driver’s license or an official government document. I thought this was sufficient, but since I started printing these, 90% of teachers have returned theirs asking for it to be re-printed to include date of birth. At first I was confused by this. 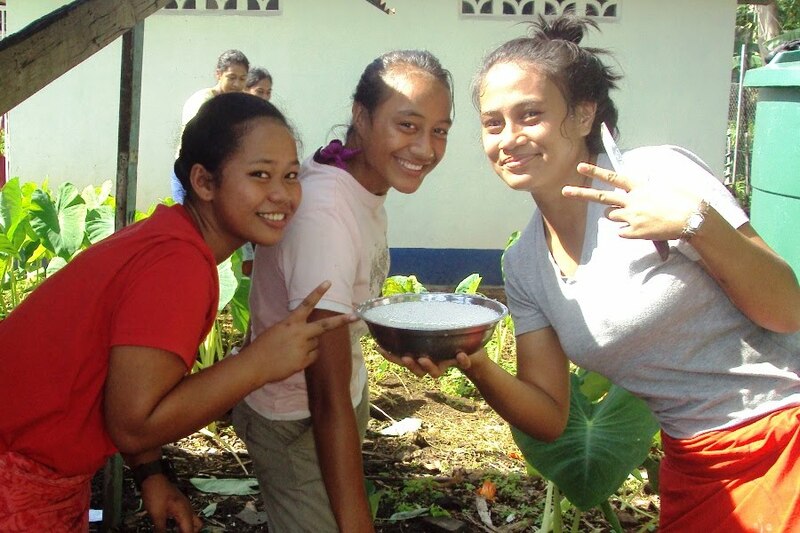 From what I’ve seen and from what I’ve heard from other volunteers, birthdays aren’t a big deal in Samoa. When I first arrived at my school, I was a little worried because my birthday falls in February (i.e. 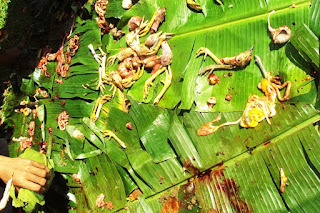 near the beginning of the school year), and I wasn’t clear on what the proper fa’asamoa is for celebrating one’s birthday. As it turns out, it seems the custom is to do absolutely nothing. RPCV Dylan told a story during our training about how he knew it was one of his co-workers’ birthday once. So when he saw him on campus, he gave him the normal “Happy birthday!” The co-worker gently shushed him and told it to keep it under wraps. When it’s your birthday, you’re obligated to throw the celebration, and his co-worker would have had to buy everybody lunch if word had gotten out. My students seem to regard birthdays in the same way. I had to type a bunch of the registration papers for the Pacific Senior Secondary Certificate exams last year, and I noticed one of my computer students had a birthday coming up. So on the day, I called her out and asked if it was her birthday. She honestly had to think about it. There are exceptions, of course. I’ve been at restaurants in town when there’s been a Samoan family celebrating a birthday. Asolima’s birthday fell during training, and we made a special trip into Apia from the host village to go to the movies. 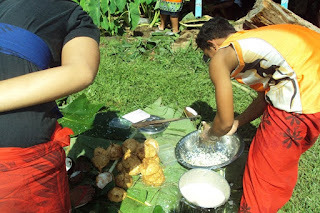 I went back to the village for Keleme’s first birthday, and there was a small party with cake and ice cream—my host family has no freezer, so the ice cream had to go fast. So why is my staff so incensed about getting their date of birth on their staff IDs? I think they want it because it’s an important fact. While birthdays don’t seem to hold the same sentimental value in Samoa as they do in the west, age is very important. It also seems like birthdays aren’t a big deal except when things are official. It’s a like a social security number in America; it has little personal value, but its use brings weight to a document or a process. 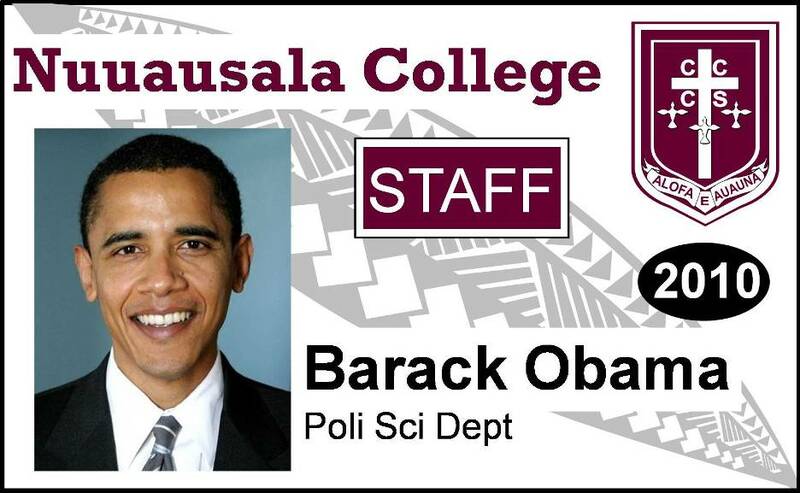 The DOB makes the ID card official. Or that’s my theory, at least. Back to normal programming tomorrow! I hope you’re well. Pictures below. Year 12 Lamauta squeezes coconut cream to make the pe'epe'e during today's internal assessment for the year 12 Samoan classes. 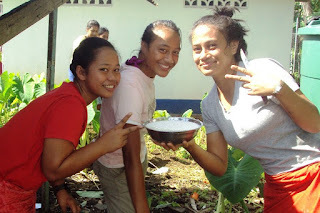 These girls prepared food for the umu. 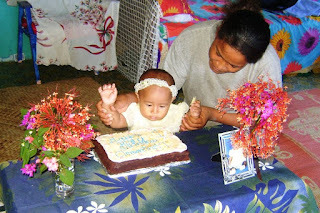 I think for a DOB to be on an Identification, makes it more professional :) But in Samoa 21st Birthday is a celebration. But for everyone, they do a small prayer and sing you happy birthday.